Has hired international workers before（Employees from Taiwan, Hong Kong, China, Thailand） เคยจ้างชาวต่างชาติ (ใต้หวัน, ฮ่องกง, ไทย). 100名以上. We at Saishunkan, based on Kumamoto, are a pharmaceutical product manufacturer that creates and sells cosmetics (including the Domohorn Wrinkle brand), medicines, and other pharmaceutical products. We began sales of our Domohorn Wrinkle products in Hong Kong in 2011, and in Taiwan in 2012. We are continue to expand our sales area not only within Japan, but in the East Asia market as well. In addition to being a manufacturer of basic cosmetics, over-the-counter and general pharmaceutical products, we are also engaged in communication with customers via order-based sales both within Japan and overseas, making us a full-service production and sales organization. Working at our company involves receiving phone and online orders for our Domohorn Wrinkle products from Taiwan, China, Hong Kong, Thailand, and other Asian countries, attending to the needs and concerns of our customers, and providing counseling about skincare to our customers. We are looking for Taiwanese, Chinese, Cantonese, and Thai native speakers who are fully versed in their home country's language and culture and who enjoy communicating with others. We will explain at our booth on the day of the event. We have over 90 international employees primarily from Hong Kong, Taiwan, and Thailand in our organization. We feel that our international employees' language abilities and overseas living experience is extremely important and necessary to our business. 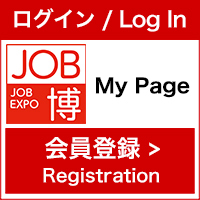 We're looking forward to meeting at our booth those of you who would like to work here in Japan.